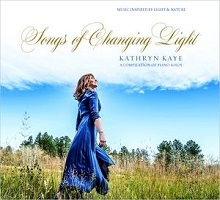 Kathryn Kaye's Songs of Changing Light features a hand-picked-by-the-artist assortment of tracks, culled from five previously released albums, but presented here as solo piano pieces (some of the earlier versions featured guest artists). These songs represent a special and deeply personal theme for Kaye, that being (per the liner notes) "The songs selected for this album reflect my love of the forest, of solitude and mystery, of changing light, and the passage of time." With that descriptor, you can imagine that these selections are low-key, gentle, and reflective solo piano meditations, and that is a spot-on analysis. Of course, that also perfectly captures Kaye's overall style, whether as a solo artist or when she is joined by others. I have greatly enjoyed all her previous releases (in chronological order: Dreaming Still, Heavy as a Feather, What the Winter Said, Patterns of Sun and Shade, and Reflected in a Flowing Stream) and have sung her praises for each one. While I have little doubt that some may decry this as being a mere retrospective effort, there are two reasons why it really isn’t. One is that those previous versions where other instruments are featured take on a whole other identity on this album, a more direct-to-the-soul pathway to deep-rooted emotion. Interestingly enough, the sparseness of the solo piano does not tone down the emotive quality of Kaye's music. In fact, quite the opposite. Needless to say, it helps that Kaye's compositions themselves are wonderfully subtle, sometimes bordering on a gently melodic semi-minimalism and that Kaye's playing skills, her deft control of nuance for example, are emphasized when they are stripped of all other sounds. The other reason that this album is "not just for Kathryn Kaye completists" is because Kaye hand-picked them and it sounds like it. Track sequencing and overall tone/mood of the album make it clear how special the "whole" of Songs of Changing Light is. So, even if you have all her previous recordings, I still think you should add this wonderful release to the stack. It's difficult to single out specific songs for more detail in this review, although the flowing melodicism of the opening "Winter's Deepest Sleep" is a great opening selection, rich with warmth (despite the title). Some of the other tracks take a more restrained approach, as I mentioned earlier, exploring a more minimalist approach (but that's a relative statement as nothing here is loud, boisterous, or heavily dramatic). Kaye's composing always emphasizes "less is more," and she excels at exploring the space between notes, as well as shadings of volume and tempo that require a near surgical talent to control the music so specifically. For example, "Heavy as a Feather" showcases her strength at mixing her left hand and right hand playing in such a way that, while the two "melodies" are synchronized, they are also uniquely separate. One thing unrelated to this specific recording but I wish to mention anyway, because I believe it informs her performing/playing is Kathryn Kaye, the person. Having spent time with her at a few Zone Music Reporter gatherings, I am impressed with her wit and sense of humor. Her performance at this year's event featured some funny moments between songs; she came across as well-grounded and unpretentious as anyone in the genre. In addition, her genuine friendliness, her warmth, and her smile (which lights up a room), all add to her overall charm. Likewise, her music reflects the gentleness of her soul perfectly. When I returned home from New Orleans and listened to Songs of Changing Light the first time, post-NOLA, I enjoyed a new sensation, that being one of a form of personal intimacy. I sincerely felt closer to the music, and to the musician, than I had previously. What does this mean to you, dear reader? Simply that if Kathryn Kaye ever comes to perform anywhere near where you live, do yourself a giant favor and make the effort to see her. Trust me, you will treasure the event.